My new addition to my brush collection is just gorgeous! Have a look at it! I was really excited about the launch of the Mac 135 brush. You could say that I am always excited about new brushes (except those odd toothbrushes look alikes they launched a year ago) but I was specially excited about this one as it had a shape that I love and tend to go for. My current favourite setting powder is the Clinique powder brush pictured above. I like the flat paddle shape and use it to gently sweep and pat powder all over my face. As you can see the Mac 135 is very similar, just a tiny bit smaller overall. I also compare it to one of the old Dior blush brushes. The Dior one is a fuller brush with a flatter top and thus picks up more powder. I use it for a higher coverage or even to apply blush with the tip. In my opinion the hair feels like very nice goat hair. Perhaps the fact that it is not dyed helps in this regard. It feels the softest of these three if you gently swipe it, however if you hold it perpendicular to your face you will feel the bristles. I tend to like my flat blush brushes on the small side and as you can see the 135 is not that big in comparison. The Mac 127 (LE, Alluring Aquatics) has a similar shape but scaled down. Also, this is a brush that has a natural hair side and a synthetic hair side. I find this to be a bit gimmicky in my opinion, but the shape is wonderful and it is not scratchy. 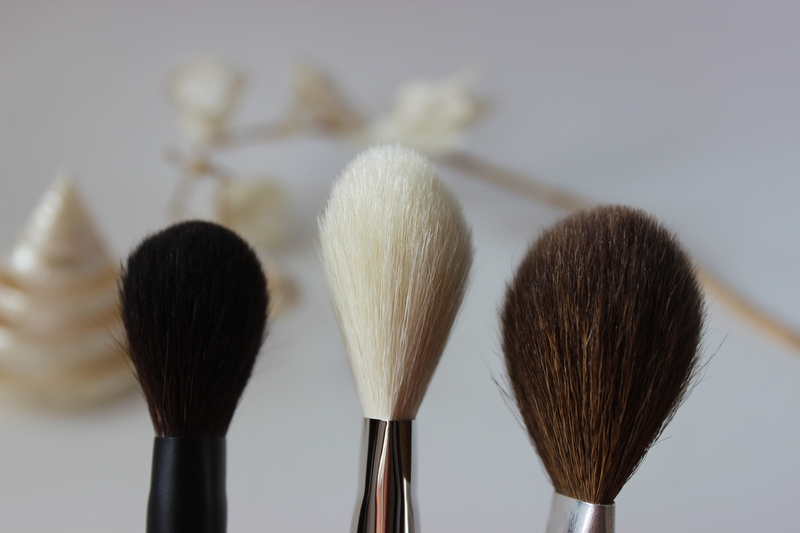 My favourite flat blush brush is the Sensai one. I picked it on a whim and I could not be happier with it. It is flat, full enough and not floppy at all. The hair is super soft, and I would dare say that it might be squirrel bristles though I have not been able to confirm it yet. 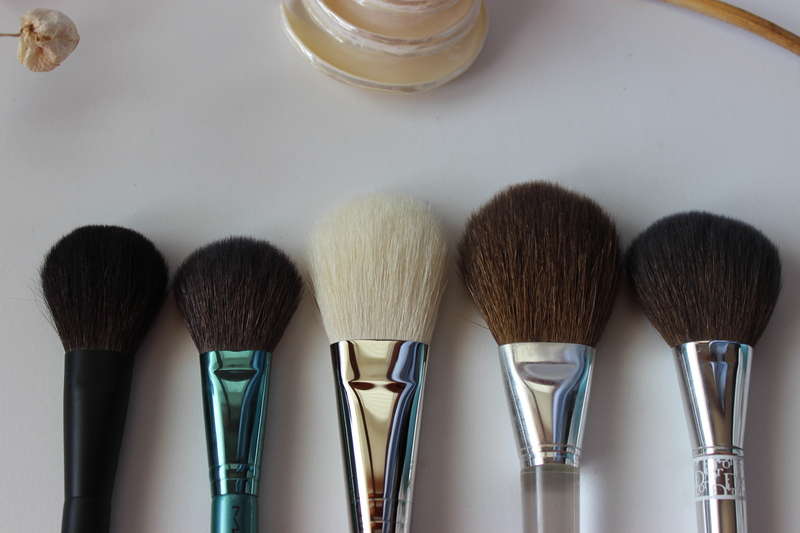 Using these smaller brushes to set your foundation would mean dipping them various times on your compact and they would deposit it less diffused. You would risk then a heavier result. They might work for small areas but I feel that the Mac 135 is a better candidate overall. Above you can compare the five brushes side to side. As said before, the Mac 135 is bigger than my blush brushes but a smidge smaller than the powder brushes. As it is also less fluffier and fuller than the Clinique or the Dior, it will give me a more natural finish and more diffused application. 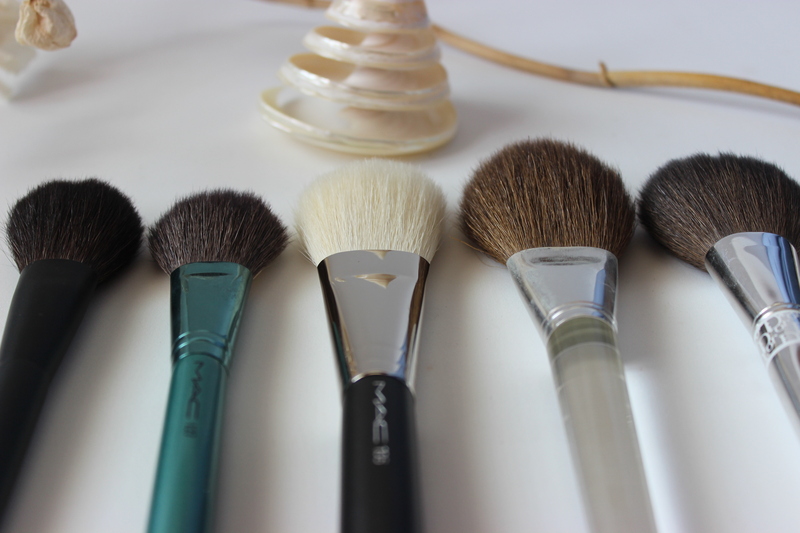 In the picture above you can see the differences in the fullness of the brushes heads. 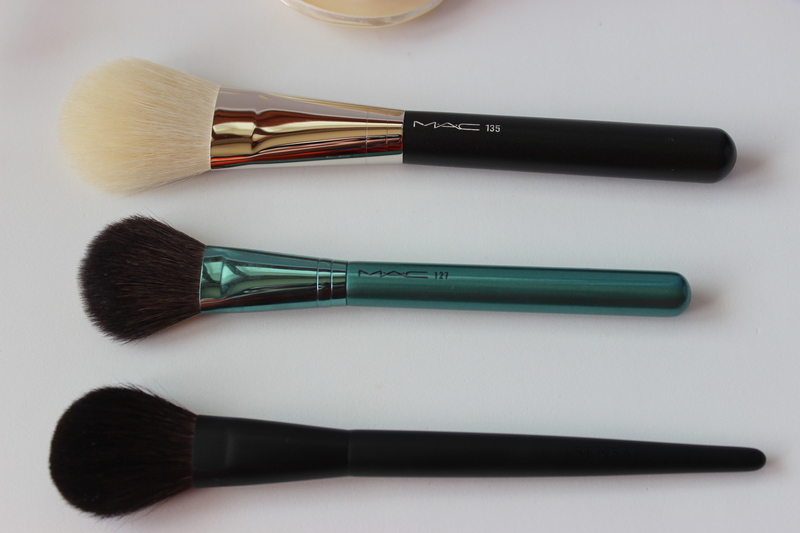 Pictured above you have the Sensai blush brush, the Mac 135 brush and the Clinique powder brush. I might even go so far as to say that the 135’s tip could work for subtle contouring. 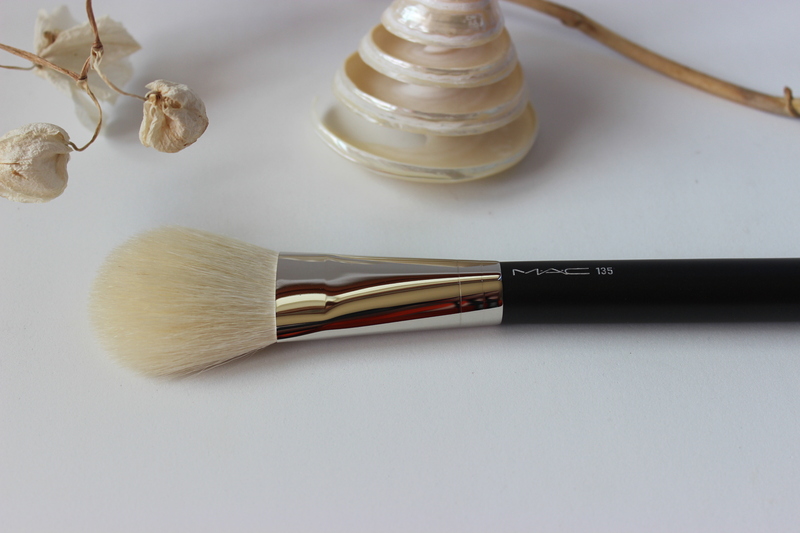 All in all, the Mac 135 is a very nice brush if you are looking for a natural effect and do not need the softest brush on the market. Its shape is one that I really like and the bristles are from good quality hair. I would say it is a step up from the well known Mac 129 or Mac 138. I have been told that there are a few more brushes to be released and if they are of the same quality or the 135 or of the 221 and 137 reviewed here then I will really look forward to seeing them! I only have MAC eye brushes, no face brushes. I’ll remember this one though. 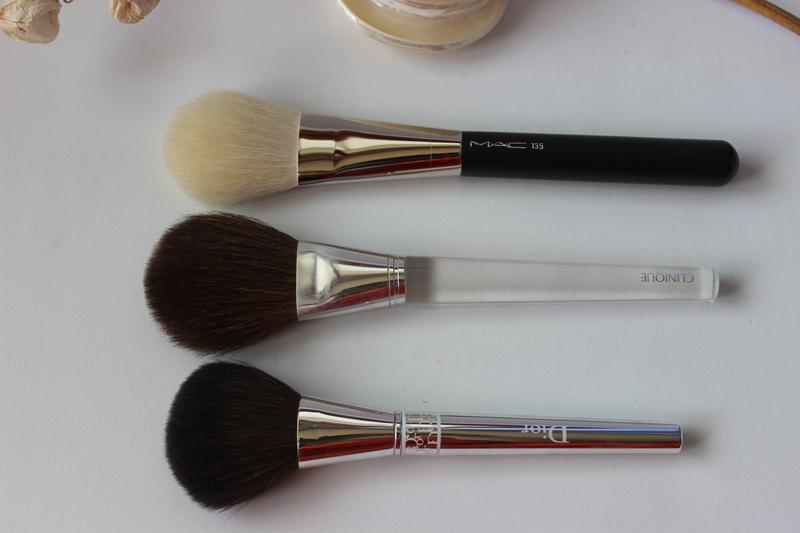 I love flat paddle brushes for face powders, so I could not resist! This brush looks like it would be great for bronzer too!